Vuze BitTorrent client (previously Azureus) has recently reached the 5.7.3 release with many new features, UI improvements, and some bug-fixes. 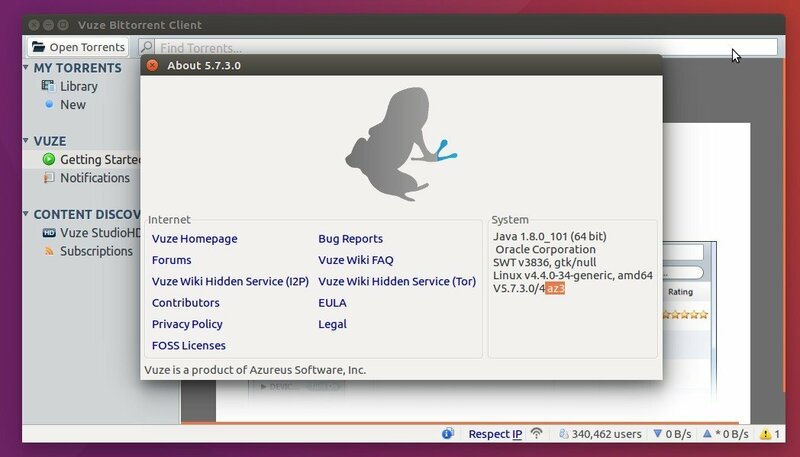 While Ubuntu 16.04 offers only Vuze 5.7.2 through a snap package in Ubuntu Software, here’s how you can install the 5.7.3 release via the traditional .deb package. See more at the wiki page. For those who don’t want to add PPA, grab the .deb packages for azureus and then vuze from THIS PAGE. And the Getdeb repository can be disabled or removed via Software & Updates (Other Software tab) utility. Thanks man! it’s working Fine! It’s safe from my experience. The repository ‘http://archive.getdeb.net/ubuntu xential-getdeb Release’ does not have a Release file.